Propane is a fossil fuel and a component of natural gas. Over millions of years it formed from the organic remains of organisms and is mined from underground deposits. Propane gas is an organic compound made of three molecules of carbon atoms bonded with eight hydrogen atoms. The type of carbon-carbon carbon-hydrogen bonds determines the structure of propane molecules, which follows the same pattern as other types of natural gasses like methane and butane. The chemical formula of propane is C3H8. Propane is classified as an organic compound because it contains carbon. It is further categorized as a hydrocarbon because it belongs to a group of organic compounds that are made of only carbon and hydrogen. More specifically, propane is a type of hydrocarbon called an alkane. The atoms in alkane molecules are held together by single covalent bonds, and carbon atoms always form four covalent bonds. Alkanes follow a general formula with a set ratio of carbon atoms to hydrogen atoms: C_nH2_n+2. The simplest alkane is methane, otherwise known as natural gas. It contains one carbon atom bonded to four hydrogen atoms. For methane, n = 1, so the number of hydrogen atoms it has is equal to 2(1)+2 which equals 4. Ethane contains two carbon atoms bonded together, and each carbon is bonded to three hydrogen atoms for a total of six hydrogen atoms. 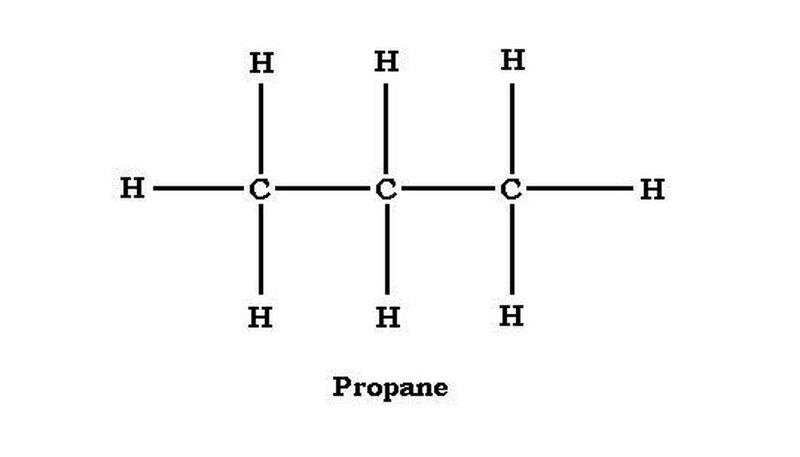 Propane has chain of three carbon atoms, with a chemical formula of C3H8, because a chain of three carbons require 2(3)+2 hydrogen atoms, which equals eight. Butane, another common alkane used as fuel in hand-held gas torches, has four carbon atoms bonded with ten hydrogen atoms, with a chemical formula of C4H10. Alkanes can be structured as either straight chain or branched chain. Propane is a straight-chain alkane, with the carbon atoms structured C-C-C. The middle carbon shares one bond with each of the end carbons and has two hydrogen atoms. The end carbons each share a bond with the central carbon atom and are each bonded with three hydrogen atoms. In terms of individual carbon atoms, propane can be expressed as CH3CH2CH3, which is equivalent to C3H8 but makes propane's structure more explicit. In addition to the structural similarities shared by straight-chain alkanes, they also share similar properties. Propane and other hydrocarbons are non-polar. This property dictates that they can only mix with other non-polar substances. 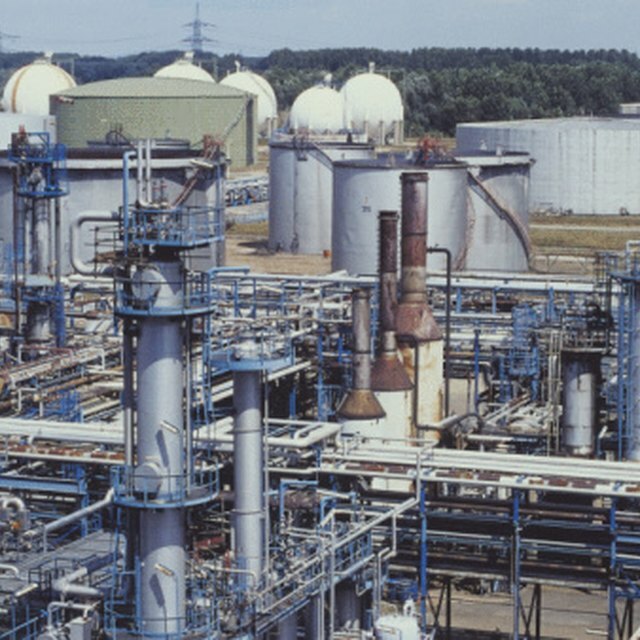 For example, oils and other fuels are made from a mixture of hydrocarbons. They will not mix with a polar substance such as water; the attraction between the molecules makes oil and water separate. With straight-chain alkanes, boiling point and melting point increase as the number of carbon molecules increases. The propane boiling point is −44 degrees Fahrenheit (−42 degrees Celsius) and the melting of −306 degrees Fahrenheit ( −189 degrees Celsius). Methane, with only one carbon, has a lower boiling point than propane at −164 degrees Celsius. Octane has eight carbons and a boiling point of 98 degrees Celsius. Because of its low boiling point, propane is normally found in its gaseous state. When the correct amount of pressure and temperature are applied to propane, it goes through a process called liquefaction that forces propane gas into its liquid state. Propane can be stored as a liquid in pressurized tanks well above its boiling point. Liquified propane gas is used as a heating fuel that is burned to power furnaces and hot water heaters. It is also used as a cooking fuel for outdoor gas grills and gas-powered camping cooking stoves. Propane gas is also a component in propellants used in aerosol cans. Propane is also used as a component in some types of adhesives, sealants and paint. Mentzer, A.P.. "Chemical Formula for Propane." Sciencing, https://sciencing.com/chemical-formula-propane-5306559.html. 25 October 2018.